Nepal’s transition from a Hindu monarchy to a secular republic is not going smoothly, and not just over the fast-approaching May 28 deadline for the nation’s new constitution. Nepal’s three major parties are at loggerheads in the special assembly formed to draft the constitution over the structure of a proposed federal system. The opposition Maoists insist that federal states be created on an ethnic basis, while the ruling Nepali Congress party and its coalition partner believe the states should be formed on a geographic basis. The Constituent Assembly was formed after a 2008 election when members voted overwhelmingly to abolish the monarchy and restructure the country into autonomous states. 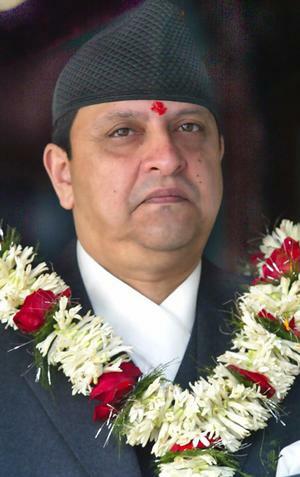 The powers of the last king , Gyanendra, had been steadily curtailed since a disastrous period of his rule ended in April 2006 amid a popular revolt. In the Constituent Assembly the opposition Maoists, who form the largest block with 40% of the seats, favor an executive presidency, while the Nepali Congress and Communist Party of Nepal-Unified Marxist are floating a parliamentary system. At the same time, public opposition to the idea of federalism is growing, as seen in the successful anti-federalism campaign being carried out by the National People’s Front (Rashtriya Janamorcha), a small left-leaning party. “Federalism is a recipe for Nepal to disintegrate, like the former Yugoslavia,” said Chitra Bahadur KC, the party leader. In his view, Nepal’s marginalized peoples would be better served through greater decentralization. A successful general strike his party organized in January is forcing the assembly to listen to his concerns. Another small party, the royalist Rastriya Prajatantra Party-Nepal (RPP-Nepal), is calling for a national referendum on federalism, as well as on secularism and a restoration of the monarchy. It last week launched a general strike that brought Kathmandu Valley, which encompasses the capital and two other districts, to a standstill. RPP-Nepal has only four members in the national assembly, but its protest campaign has attracted a wide following. Even the powerful Maoists were forced to cancel an important meeting due to the chaos and the RPP-Nepal’s large rallies managed to block the entrance to Simha Durbar, the seat of central government. The party also wants a referendum to address Nepal’s status as the world’s only remaining Hindu state, which was abolished in 2008 when Nepal became a republic. More than 80% of the population is from the Hindu faith, also known as Sanaatan Dharma (the eternal law). Hinduism, the third-largest religion after Christianity and Islam, is known for its tolerance towards other faiths. Nepal, with a sizeable Muslim population, does not possess the type of religious rivalries seen in India. This, however, is undergoing a subtle change. There are growing feelings that too much tolerance could impact on Nepal’s Hindu way of life, especially if there is a lack of reciprocity from other faiths. The concern has grown since the proselytizing activities of Western groups that had entered Nepal in the garb of non-governmental organizations were exposed. The Hindu backlash against Nepal becoming a secular state has grown since 2006 when the monarchy first fell and the state was established, but the leaders of some prominent political parties believe the recent popular movements may also be a power play by right-wing elements. And they are also jittery about a possible revival of the monarchy. 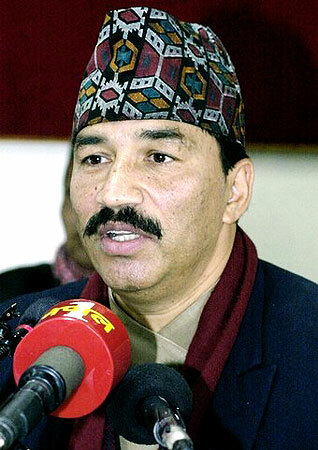 Kamal Thapa, who heads RPP-Nepal, denies that his party is working to restore the monarchy’s absolute rule. “All our party believes in is the restoration of a ceremonial institution that provides a symbol of unity for a country that is known for its ethnic diversity,” Thapa told Asia Times Online. [Right: Kamal Thapa,the current president of Nepal’s only royalist party, the Rastriya Prajatantra Party. He served as Home Minister during King Gyanendra‘sdirect rule in 2006, until the king was forced to handover power to Gerija Prasad Koirala of the Nepali Congress Party and his allies with CPN-UML and CPN-Maoist. Thapa and his party are on a signature campaign, asking for a referendum to decide the fate of monarchy. The RPP president claims that no political party in Nepal possesses the guts to safeguard Nepali Nationality. “Now the onus lay only with the institution of monarchy to safeguard Nepali sovereignty and National Unity”, says Thapa. He has further urged upon the government to re-investigate the royal massacre and dig out the truths. Thapa’s ideas appeal to many, as the 2006 declaration that made Nepal a secular nation was made without consulting the people. The May 18 declaration was made in a parliament that had been restored through royal proclamation, and the person who made it, Girija Prasad Koirala, was sworn in as prime minister by Gyanendra himself. That declaration was illegitimate and should have been challenged there and then, according to Bishwanath Upadhayaya, a former chief justice and the head of the panel that drafted the 1990 constitution. If the changes were the outcome of a mass movement or a revolution, it should have been documented as such, he maintains. Instead, sweeping changes were abruptly announced by Koirala on the grounds of bringing the Maoist insurgency (1996-2006) to an end and bringing the rebels into mainstream politics at all costs. Maoist leader Pushpa Kamal Dahal (popularly known as Prachanda) has now become one of two important figures who concede that the secularization of Nepal was a mistake. The other person is none other than the incumbent President Ram Baran Yadav. Yadav made this clear to a controversial Indian holy man, Chandraswami, when he was on a pilgrimage to Nepal. Former prime minister Koirala purportedly evaded the question. Unlike rulers in Delhi, media reports indicate that India’s Hindus want the religious identity of neighboring Nepal to remain unchanged. For them, too, this is an emotional issue. If Nepal’s secularization was a mistake, this could be rectified when Nepal receives its new constitution. There is no need for a simultaneous restoration of the monarchy, which ceased being the custodian of the nation’s Hindus after the notorious palace massacre of 2001. Nepal could now learn to stand as a Hindu republic, not a kingdom. Next PostCan Japan Say No to Washington? I think through an oversight your comments on comparison of Indian ‘handling’ of Kashmir, Sikkim and Nepal, was entered under the post captioned “Plight of Thar”. By chance I landed on to this post and saw your comments. In order to facilitate all other regular readers of this blog like me, who want to see your comments, I have copied and pasted below these observations . I hope the blog editor does not mind my ‘jasarat’. This is a message from the people of Nepal to the Govt. of India to learn a lesson from Kashmir. The current strategic alliance between the Indian Intelligence agency the RAW and American CIA in this region is a dangerous signal for Nepal, Pakistan as well as China. The strategy to counter the malicious intent of these two notorious spy rogues, demands that Pakistan and China both forge a unified stand against India and help the Nepali patriots against RAW’s machinations directed towards the state and people of Nepal. A word of caution for the current Chinese leadership: The current Chinese leaders need to follow the stratagem that was practiced by the great Chinese leader former Chairman Mao Ze Dong, who never had trust in Nepali communists because of their short sighted approach vis-à-vis the regional strategic position of countries in the south Asian region, which is why he always favoured the Nepalese monarchy, as the king always fought against imperialistic designs of both India and the USA. Now India is once again trying to capture Nepal, first by adopting an Ostrich like attitude towards the Chinese, and second by trying to become a broker for US and UN and to achieve this nefarious objective, India as always is exploiting our the so called Nepalese politicians. India already did this in 1989 and now trying once again to have an absolute control over Nepal’s foreign, defence and home affairs as she did then by terrorizing King Birendra through mass movements which she instituted through behind the scenes conspiracies. In disputed Kashmir region, India has constructed 40 km long tunnel investing billions of rupees to connect Jammu through an all weather road to main Kashmir valley. However, Kashmiris never did favour this link with India. If Indian designs in Nepal are like that of Kashmir, Bhutan and Sikkim, India won’t be safe any more. Becoz when terrorism is institutionalized and state of India becomes a sponsor of terrorism in Nepal, as it is doing in Kashmir, India is playing with the fire. Therefore we warn the Indian Govt. to correct its policies and avoid blunders which will culminate in India’s own disintegration as well. Indian Govt. wants to shape Nepalese defence and foreign policies in accordance with its whims and wishes. Since 2006, Nepal is being guided by pro-India parties. After the downfall of Maoist led-government in May 2009, Sujata Koirala, who has no diplomatic capabilities, was appointed as a vice-PM and foreign minister of Nepal. Her only credential though is that she is the daughter of Mr. Girija Koirala and is a corrupt, anti-nationalist lady. It seems the same old strategy is being adopted to stab in the back of Nepali nation so that they surrender to India’s diktat. A cursory look at the list of Nepalis appointed on diplomatic assignments shows that most of the ambassadors of Nepal particularly in Nepal friendly countries are smugglers, murderers and criminals who have no idea of foreign affairs. Therefore, it surprises no one that Nepalese foreign policy is in a shameful status on international level. After 1990, Nepalese people never became free though they were called sovereign. As the King was deprived of sovereignty, in 1974 in Sikkim, under the leadership of Lendup Dorji Sikkim parliament decided to unify with India on 10 April 1975. Similarly in Nepal, using Girija Prasad (former PM), Madhav Nepal (PM) and few Maoists, India is trying to capture Nepal again. The factors behind failed foreign policy of Nepal are the betrayers, the leaders of Nepal and this is being exacerbated through an ever going interference by India. India has always involved herself in conspiracies to shrunken Nepal. 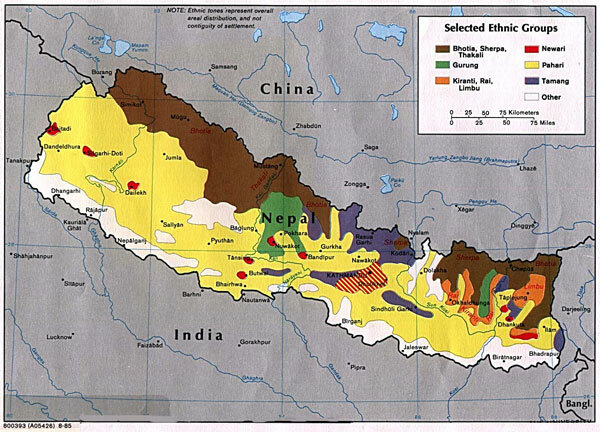 Geographically Nepal is situated in between a large sized China in the north and India in south. It has borders with India in the east, west and south, which is an 1880 km wide boarder. Besides, there is open border as well, which helps India to attack or encroach upon Nepalese territory. Then there are Indian citizens in Nepal who often commit crimes here and then hide themselves in India. Indians initially enter Nepal as small and large scale business persons / traders and ultimately demand for Nepalese citizenship. In 2006, 4 million Indians succeeded in taking Nepalese citizenship. Being landlocked country, Nepal must have transportation facility in accordance to international treaties and traditions. But India violated it and wants to control over Nepal. Former Member of Parliament, Nepal. Now coming to your comments as above , I hundred percent agree with you. It is a need of the hour that the Govt. of Pakistan as well as the Chinese leadership together forge strategy by which they can help out Nepal against an ever going aggression by Congress Govt. As for the opinion expressed by the writer Dhruba Adhikari of this essay who believes that Nepal should be a 100 percent democratic country, in principle no one would disagree with that. But unfortunately, in many cases, when a symbolic head of a state keeps a country unified, is removed, ‘in the name of democracy’ the successors start looting the country. I am not in a position to comment on what should Nepal do or not do. The people of Nepal are the best arbiters in this regard but would only quote an example. Till mid seventies King Zahir Shah ruled Afghanistan and there was never any trouble with the tribal system and a loose confederacy of tribal culture prevailed there. But once the king was removed, everyone knows what happened with the country and its concept of a united Afghanistan. When there is a political vacuum, either the warlords, or ‘democratic’ dictators take the reins of power and then what comes out is exactly what the people of Afghanistan are facing. Thanks a lot for very practical and sensible advice to all the governments involved, of China Pakistan as well as India. pakistan. ; let the Baap U.S and sit in the lap of Chacha China . Good luck …..
What DRP has said is one thing but how it is being propagated is the other. Plotters active for next plot .They may be active even in Australia against India but our bonds are strong enough to absorb the shock by giving it a constructive Impact ON THE WORLD OPINION .The Opinion of the world body .- The UN . I’m neither the politicians nor an expert in political analyses. I’m just a common citizen but I would only like to refer Indian government’s counterparts that if they try to capture an inch of our country, just think of tomorrow what a blunder would they make as we Gorkhas though will not emerge as a majority like Indians, counting by their huge numbers in population yet even though we are small in quantity, we fight like fierce lions in a battle. They should worry about India itself as history shows how the British forces defeated the entire Indian army in the past when they faced defeats at the hands of our valiant Gorkha ancestors through their Khukuris. Fellow Indians! Do not underestimate our strength. Remember! Even Hitler once said if I had Gorkhas in my Army I would have conquered the whole world. We are small in numbers, yet in battles we always defeat the enemy far outnumbered than us; as we are blood thirsty Gorkhalis. Indian fellas, mark my words! During Indo Pak wars, had our Gorkha soldiers not fought on your side, victory for your country would never have been that easy. So never ever do try to commit the mistake of invading our country, otherwise destructions of your country will be inevitable in future. Try respecting our sovereignty and be a good neighbor forever. Dear Kirat , The blog you have choosen to project your grivances clearly indicate that your mind has been poisoned by some anti Indian element now active in Nepal .Any way Gorkhas and Sikhs are not like Pakistani for us .We can never give them J&K to them but if you wish to integrate one of The Indian state with Nepal we will love to cooperate with you to realize it .I have no doubt about the bravery of Gorkhas and Sikhs .They are the two strog arms of Indian army .Falkland war is the proof .